(The Independent): Coral reefs are on course to become the first ecosystem that human activity will eliminate entirely from the Earth, a leading United Nations scientist claims. He says this event will occur before the end of the present century, which means that there are children already born who will live to see a world without coral. The claim is made in a book published tomorrow, which says coral reef ecosystems are very likely to disappear this century in what would be "a new first for mankind – the 'extinction' of an entire ecosystem". 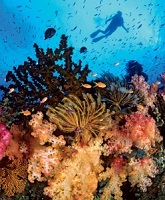 Its author, Professor Peter Sale, studied the Great Barrier Reef for 20 years at the University of Sydney. He currently leads a team at the United Nations University Institute for Water, Environment and Health. The predicted decline is mainly down to climate change and ocean acidification, though local activities such as overfishing, pollution and coastal development have also harmed the reefs. The book, Our Dying Planet, published by University of California Press, contains further alarming predictions, such as the prospect that "we risk having no reefs that resemble those of today in as little as 30 or 40 more years".